Bell tents at Papawai Camp, near Greytown. Although Featherston was the main camp, there were several other military camps in the south Wairarapa. Tauherenikau was established in 1915 and was occupied at times until war’s end. Papawai Camp, by the rifle range east of Greytown, was set up and used for range shooting and machine gun training. Canvas Camp was attached to Featherston Camp. A special camp (C.1) was set up to bring unfit men up to army standards, starting at Canvas Camp in 1917 but soon moving to Tauherenikau. Tauherenikau Camp was on a farm near the Tauherenikau River. The men lived in tents and there were few buildings. It was noted for the stony ground. After Featherston Camp opened, Tauherenikau was used as a temporary site. In the winter of 1917 a four-camp system was on trial to prevent infection spreading among recruits. The C.1 Camp was moved to Tauherenikau in late 1917 and over 3,000 men had spent time there by war’s end, with half progressing to the proper army. A feature of the camp was the decorative stonework made by soldiers. After the war a farm training camp for returned soldiers was on the site until 1923. 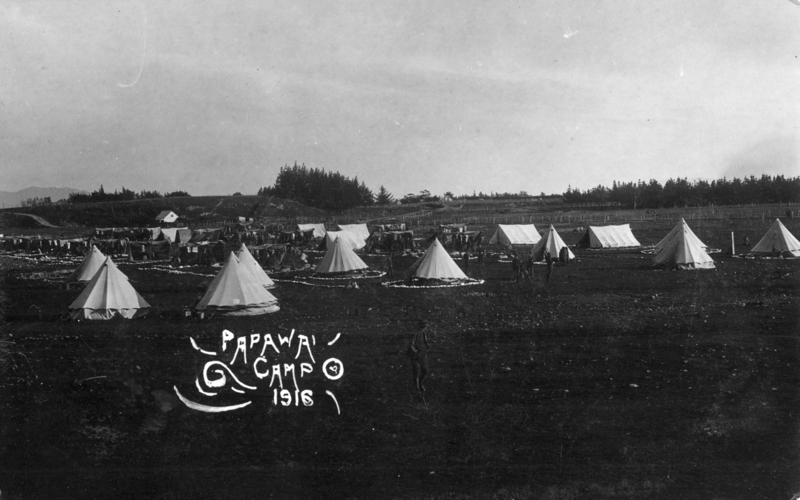 Papawai Camp, a small tent camp housing up to 500, was set up about September 1915, soon after Tauherenikau Camp. It was mainly used by mounted rifles but other troops did shooting courses there, with a return march from Featherston Camp (about 20km). The existing rifle ranges were used for training. The machine gunners had a special range, firing across the nearby Ruamahanga River. Field artillery fired from the flats near Morison’s Bush into the high ground around Jury Hill. Canvas Camp began soon after Featherston Camp opened but was not occupied all the time. There was tent accommodation for about 3,000 soldiers, and basic dining halls. A small wooden railway ran from Featherston Camp. Typically, a reinforcement would move into Canvas Camp a few weeks before training ended and would depart from there on the march to Trentham.